Once upon a time in Toledo, there was a place called the “Tenderloin”. A segregated area of businesses and homes near downtown, where life was lived on the wild side. A place where one could buy most anything to satisfy the cravings of flesh. If you wanted it, it was probably for sale. It was its own city in a way, which operated independently of the laws that governed morals and vice in the city, and it was a magnet for those who sought to live their lives on the tattered hems of society, if only for a few hours a week. This was the Toledo Tenderloin. It is gone now. The only remaining evidence of its existence are the stories and what was committed to print. History researcher, Doug Tracy has spent a considerable amount of time tracking those old stories of the “district”, and what took pace there. Part of his interest was personal, in that his great grandfather, Toledo Police Detective Lewis B. Tracy, was the police officer in charge of keeping peace in the Tenderloin. Maintaining the fragile balance of what was “allowed” and where to draw the lines of propriety in a neighborhood where little was considered “improper”. Toledo in 1918 was a war-weary, fast-growing and extremely busy Great Lakes port city, with a population that was rapidly approaching a quarter of a million people. World War 1 was reaching its apex overseas; horses and ‘machines‘, i.e., cars, still mingled in the streets of the city; Victorian attitudes still lingered from an earlier period, while the passage of the 18th and 19th amendments (prohibition and women’s right to vote) was just around the corner. The newspapers of the day were filled with titillating stories about ‘cops and robbers’, ‘birdmen’ (aviators), ‘yeggs’ (safe-blowers), ‘blind tigers’ (speakeasies), ‘slackers’ (draft-dodgers) and, of course, the war overseas. It was also a time when brothel Madam Nellie Schwinn was conducting business at her ‘resort’ on Lafayette street in the city’s thriving red-light district, also known as the Tenderloin, an area just a few blocks from downtown core, full of rooming houses, saloons, gambling halls and questionable characters. 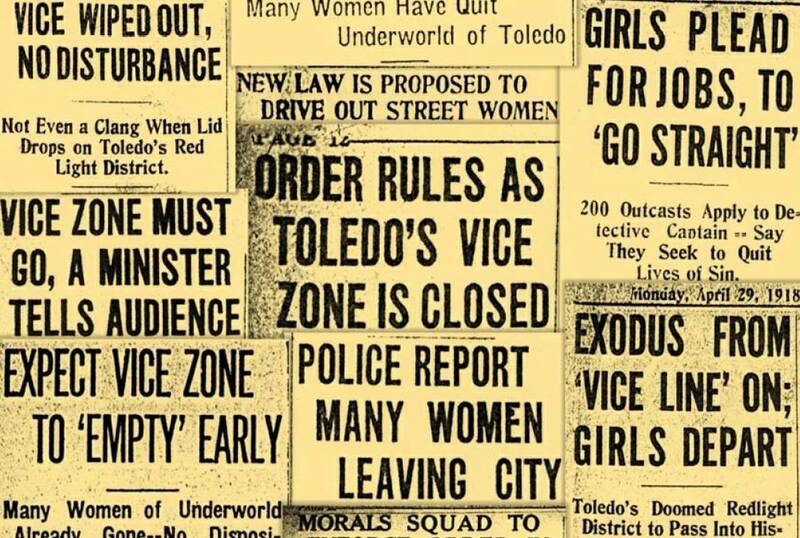 Toledo police, including Detective Captain Lewis B. Tracy, routinely patrolled the area, doing their best to maintain some semblance of order, but were simply unable to completely purge the streets of the grifters, pickpockets, thieves, prostitutes and drug users who preyed on the frequenters of the district. 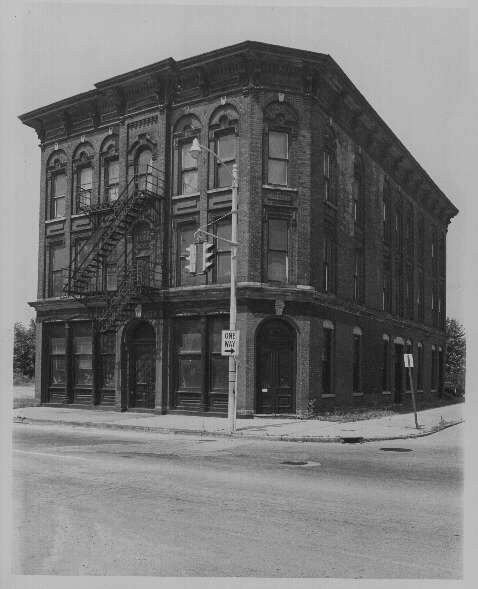 The Tenderloin District covered a number of city blocks in the vicinity of Lafayette and Washington streets and Swan Creek – near the area now occupied by Fifth-Third Field, home of the Toledo Mud Hens. There were an estimated 35 houses of ill-repute, not to mention many more saloons, pool halls, gambling joints, wine rooms and seedy rooming houses. Newspapers of the day paint a picture of the Tenderloin District as an area “beneath the dead line” where thieves, gamblers, grafters, sporting women, degenerates and drunks ran free. The police department did its best to control things, but could not keep up and often looked the other way. In the late 1800’s and early 1900’s there had been many efforts by Toledo’s leaders to clean up the area, but none were entirely successful. In late 1915, Detective Tracy presented to the citizenry new regulations and rules that were drafted by the police department to improve conditions for “dance hall proprietors and persons engaged in immoral business”. The new rules included prohibition of dance music from Saturday midnight until Monday morning, outlawing outsiders from bringing liquor for ‘inmates’ into resorts, a three-times-per-year limitation on changes of residency of ‘immoral women’, bi-weekly medical inspections of the inmates, establishment of a registration system that included photographing ‘outcast women’ for a ‘rogues gallery’, and a general war on men profiting from inmates. Toledo at the time was truly a melting pot of nationalities and cultures, situated at the geographical crossroads that drew Great Lakes sailors and ‘underworld’ figures moving between Detroit and Cleveland. The criminal subculture in Toledo was a major law enforcement, as well as moral, problem for upstanding Toledoans. The various clean-up campaigns by city officials to rid the city of immoral behavior throughout the post-Civil War and Victorian eras had been, at best, only marginally successful. In early 1918, the War Department issued clear directives to America’s cities to take measures to protect draft-age young men from social diseases as well as from crime. The fervor of patriotism was never higher and Toledo, following the lead of many other cities, was quick to seize upon this opportunity provided by the War Department to draft local laws and organize campaigns to drive the ‘immorals’ from their city as part of their contribution to the war effort. 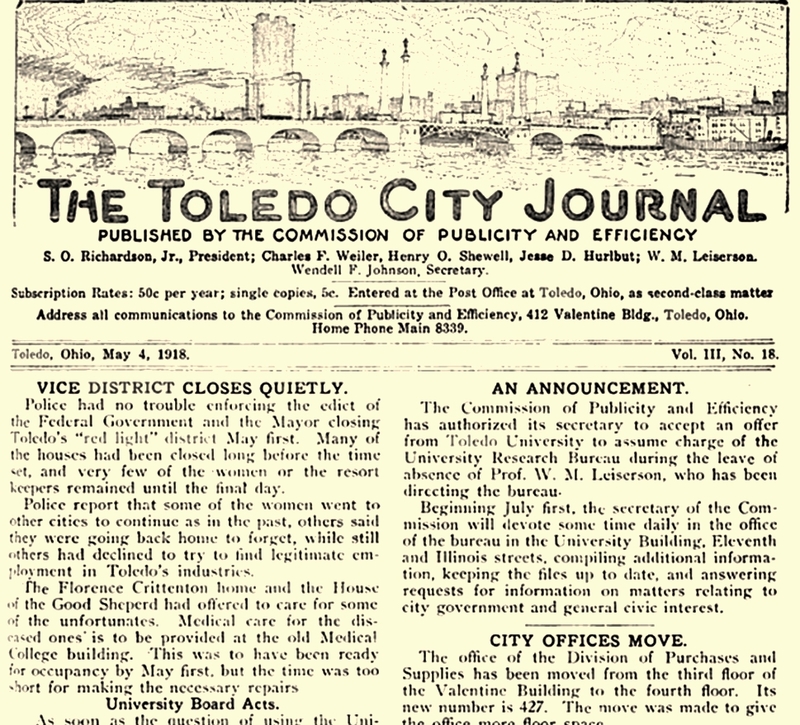 Toledo’s clean-up campaign picked up steam in the spring of 1918, with near unanimous support of the public. City Council wasted no time passing the statutes necessary to support the campaign. 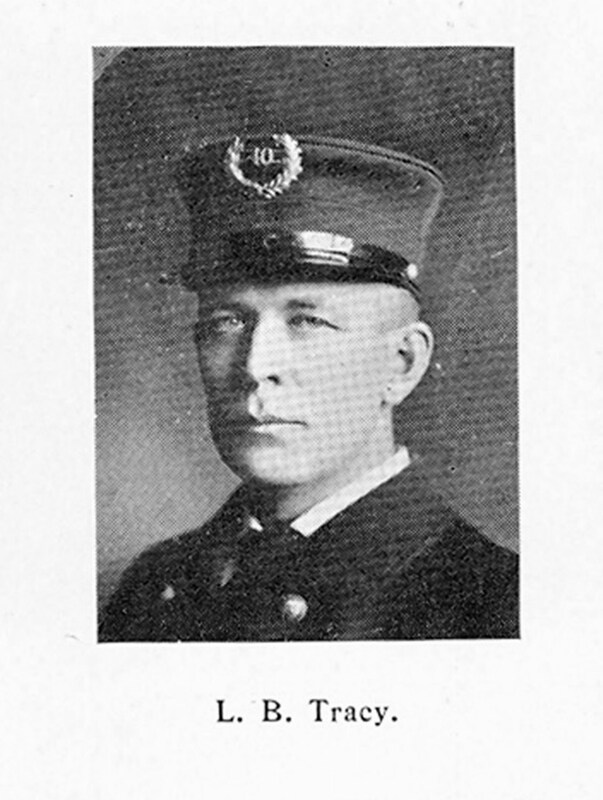 The Mayor and Police Chief developed new guidelines for the officers on the street and set May 1, 1918, as the date that all of the perpetrators of immoral activity in the Tenderloin would leave town, or face lengthy jail-time and fines. With the deadline set, public excitement escalated as city officials worked with civic groups, health professionals and church leaders to devise a plan for an orderly eviction from the Tenderloin. There was much speculation by the public as to what would be the outcome of this campaign. Health professionals made plans to open clinics and hospitals in the vice area to test and treat the afflicted. Venereal disease was the primary concern, but scarlet fever, diphtheria and morphine addiction were also major concerns, as was influenza, which was just beginning to cause epidemic numbers of deaths throughout the country, as well as around the world. In neighboring cities and villages there was particular concern that eviction of Toledo’s worst meant that the criminal element would simply migrate to other neighborhoods or surrounding towns and set up shop there. Some of the proprietors of the older established resorts had no intention of leaving Toledo. Instead, they made plans to close their resort businesses and convert them to strictly stag rooming houses, i.e., no women allowed. 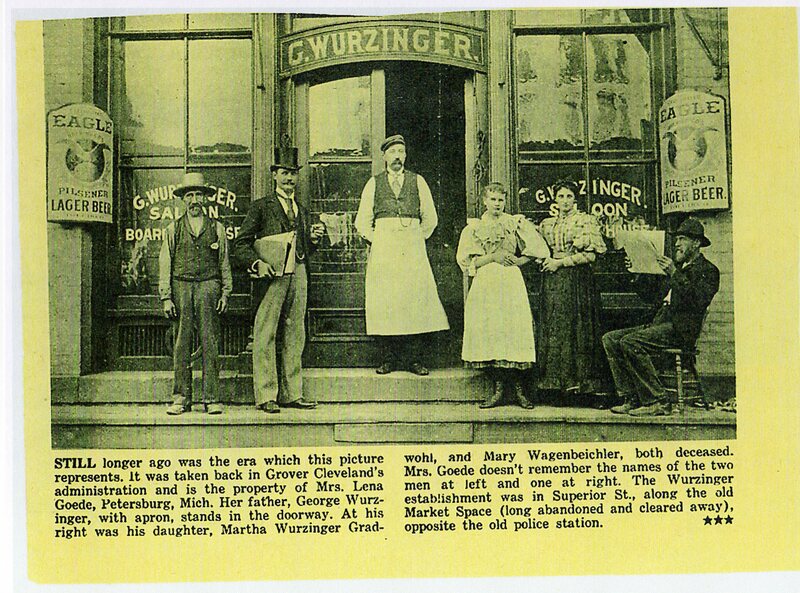 The Toledo Blade reported that one proprietor of one resort at Superior and Lafayette streets (where the Spaghetti Warehouse is now located) did not want to abandon her house because it was “. . . said to have between $10,000 and $15,000 worth of mahogany and Circassian walnut furniture, Brussels carpets, costly draperies, masterpieces in oil paintings and classic statuary.” Apparently not all resorts were shabby establishments. Detective Captain Lewis B. Tracy, in charge of registration of immoral women, said Monday that since Mayor Schreiber’s order to resort keepers that they must close by May 1, on request of the federal government, more than 200 girls have come to him and asked for employment. Tracy says these girls tell him they desire to quit the old life and enter legitimate employment as domestics, clerks – any honorable work to which they may adapt themselves. Two orphans, 20 and 21, respectively; who have been living immorally one year, came to Capt. Tracy Monday morning from a house on South Erie street. Both are white girls. One said: “I’m tired of this sort of thing, and I’d do anything to get a chance to live right. The Christian people have said in the papers they are willing to help us. Now is their chance. Her companion’s story was almost identical, and Capt. Tracy promised to do what he can for them. In the last hours of their existence, the lights in Toledo’s vice grottos shed a malevolent glow. The ghosts of myriad nights of ribaldry were abroad, patrolling for the last time the precincts where in times past they had appeared as living, flaunting things. Electric bulbs, once radiant, seemed to shimmer with a vixen-like glow, as the tapers of death, casting their last sad shadows over the figure of a corpse. .”...Never before was the tenderloin utterly crushed out, although there had been minor restrictions imposed on it from time to time. The women of the underworld accepted the order as a matter of fact. Their exodus began several weeks ago, but not all of the resorts were abandoned before the ban became effective. Many sight-seers collected during the last hours on Tuesday night in such places as were still open. There was a little feverish revelry but the district in general was quiet.No better night could have been chosen for the passing of the tenderloin. Rain swept the streets where the refuse which had accompanied the moving-out of some of the places during the day, was still scattered. Thru the cold mist, the lights of passing autos made yellow halos and the electric globes above the doorways of the houses blinked in a sinister manner. A few men loitered along sheltering walls. Cats, abandoned in the Tuesday exodus of the women, slunk thru the rain. Houses, where a few nights before there had been music and laughter, were silent. By midnight the lights above the doors of the houses had all gone out. Behind drawn blinds even the lamps were darkened. Notorious resorts were deserted and lowered heavily over the dismal streets. It became obvious, very quickly, that closing the Tenderloin had not solved the problems of disease, alcoholism and moral bankruptcy. Those social issues just moved to new neighborhoods and would continue to flourish. Forced to uproot and relocate when public pressure prompted politicians and police to “crackdown” on the visible evidence of such behavior on the streets. The closing of the “district” also provided a lesson that is still often ignored today, that it is much easier to move people, than to move what is inside of them. My hearty thanks to researcher and writer Doug Tracy, whose passion for exploring Toledo’s past continues to help promote a better understanding of where we have been as a city and where we are today. Doug is also researching the tenderloin’s notorious Madame, Nellie Schwinn. If you have any information about her, or where she fled after she left Toledo, please contact us here at Toledo Gazette. We’ll be in touch.